A Midwestern ramble by tractor, truck and train, She's Folks delivers soaring harmonies, old timey folk, quirky country, unusual gospel, and rust belt character. It's a love letter to the country from a girl who couldn't wait to leave. Joe, Taylor and Charlie at Mystery Street for their guidance and for understanding our project so well. Will for his endless support, knowledge, effort, patience, and love. I love you. The Folks for the long hours, your enthusiasm, your talent, and most of all, your friendship. You are family to me. Mom and Dad for encouraging me both as a kid and now, for being such marvelous natural comedians and storytellers, for knowing so many old goofy songs, and for the piano. Ellen and Eve, for everything. To Teddy for bringing such joy to our lives. In memory of Clyde O. Wallace, “Gramps,” who loved trains. She's Folks began as a one-night-only cabaret event created by Elizabeth Morgan in 2015 as an homage to her rural upbringing and love of folk music, as well as a little down home respite from musical theatre and her citified acting career. The evening was a hit, so "Betsy" and the Boys continued to perform at several small venues throughout Chicago. While the show began cabaret-style, featuring covers of country and folk rock music, Betsy began integrating her original songs, as well as new arrangements of pieces from the public domain transitioning She's Folks from cabaret to an original concert-style piece showcasing her signature "Story, Song and Sass." In August of 2016, they debuted with two sold out nights at Steppenwolf's newly minted LookOut theatre. In December of 2016, they premiered She's Folks' Holiday Hootenanny, a seasonal version of the show, at the Athenaeum Theatre in Chicago. In November of 2017, they will release their first EP, Elizabeth Morgan - She's Folks. With her signature Story, Song, and Sass, Morgan narratively travels her native Midwestern byways, railroads, and fields by truck, train and tractor, introducing the audience to original tunes such as "I-90 Take Me Home," "Little Town Girl," Trains," "The Threshold," "Back Home," and "The Truck Stop Where I Hung Out in High School," as well as beloved folk songs, covers, and hymns. She's Folks happily sits between genres and art forms integrating traditional folk, folk rock, bluegrass, gospel, and country music, comedy, theatre, and memoir all with a Midwestern spin. The tie that binds is story. She's Folks! is a love letter to the country from a kid who couldn't wait to leave. Where do we belong if we walk away? This show reckons, "Home isn't the place; it's the folks." 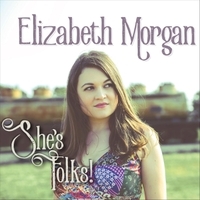 Elizabeth Morgan is an actor, singer, writer, musician, and raconteur. “Betsy” grew up amongst ragweed and farm animals in rural northwestern Ohio. She graduated from Miami University (OH) with a Bachelor of Fine Arts in Acting. In 2004, she moved to Chicago where she has performed with many theatre companies including Backstage, Boho, Circle, City Lit, Hell in a Handbag, Kokandy Productions, Quest, and Theatre Building Chicago. She will be appearing in Hell in a Handbag’s upcoming parody of Bewitched! as Samantha Stevens. Betsy is known for her diverse performance resume including industrial film, musical theatre, comedy, high camp, drama, and collaboratively devised theatre, as well as her passion for traditional folk music, bluegrass and early country. Betsy currently writes and stars in her onstage memoir She’s Folks!, as well as her weekly web series, Old Timey Tuesdays. She is represented by Big Mouth Talent.